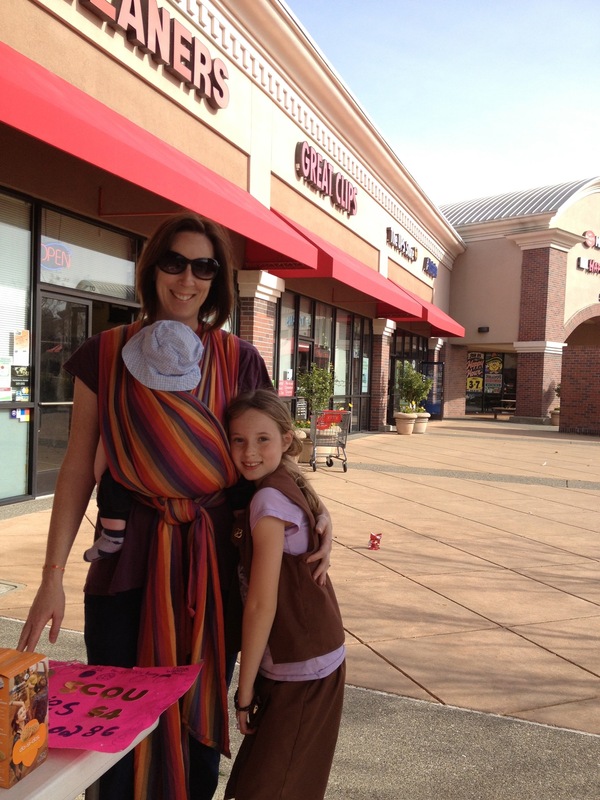 This is my 13th installment of Babywearing Stories 365. Each installment features a babywearer in 1 photograph and their answers to 5 questions. My goal is to normalize, promote and celebrate daily Babywearing, moving beyond *what* we use to carry our babies and shifting focus back on *why* and *where* we carry. I hope to share the stories of moms, dads, and babywearing caregivers all over the world. Enjoy! My name is Karin Carr and these are my kids, Madeleine (the girl scout) and Hamilton (the wearee!) Madeleine’s Brownie troop was going to sell Girl Scout cookies today at a local strip mall with a few other girls from her troop. I had volunteered to be a chaperone but hadn’t planned on bringing the baby too. Unfortunately Dad had to work late and couldn’t be home to watch the baby so I grabbed my trusty Lenny Lamb Sunset woven wrap and off we went. We set up a table covered with Girl Scout cookies and let the girls sell them to raise money for their troop. It was nice and sunny and Hamilton, who is five months old, fell asleep in no time. I loved being able to cuddle him but still give my full attention to my older daughter, who has been feeling a little left out lately since she now has to share Mom and Dad with her little brother. The baby hasn’t been the greatest sleeper lately and if he will sleep for an hour and a half in the wrap while I get to snuggle him and still get other things done, it’s a win win for us all. It’s amazing how many stroller moms came by and ogled my wrap. One lady said, “Is that just a huge piece of fabric or is it a real baby carrier?” I explained how it worked and she thought it was so ingenious. I wear him every morning and every afternoon when we do Maddie’s school run and I hope that by the end of the year I’ll have converted at least a couple of moms who are slaves to their strollers.